Deputy President Cyril Ramaphosa continues his lead in the race for presidential nomination by the African National Congress (ANC). The South African Citizen Survey (SACS), a monthly survey carried out by Citizen Surveys, since 2015 has asked South Africans about their views of the major contenders in the presidential race. 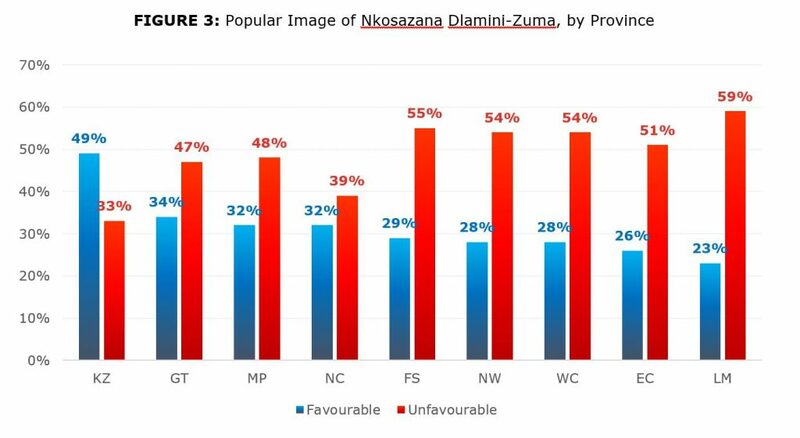 While four leaders have consistently received favourable views from at least 20 percent of all respondents (Nkosazana Dlamini-Zuma, Cyril Ramaphosa, Gwede Mantashe, and Baleka Mbete), Dlamini-Zuma and Ramaphosa are at least twice as popular as the other two contenders. While Dlamini-Zuma led the public popularity contest between late 2015 to mid-2016, the size of her lead over Cyril Ramaphosa dwindled to a tie in late 2016. However, by June 2017, Ramaphosa had opened up a 3 percentage point lead over Dlamini-Zuma. This lead has since widened to 13 points in the July to September 2017 poll. This recent poll found that South Africans’ favourable view of the four main contenders is as follows: Ramaphosa (41%); Dlamini-Zuma (31%); Mantashe (25%); and Mbete (23%). 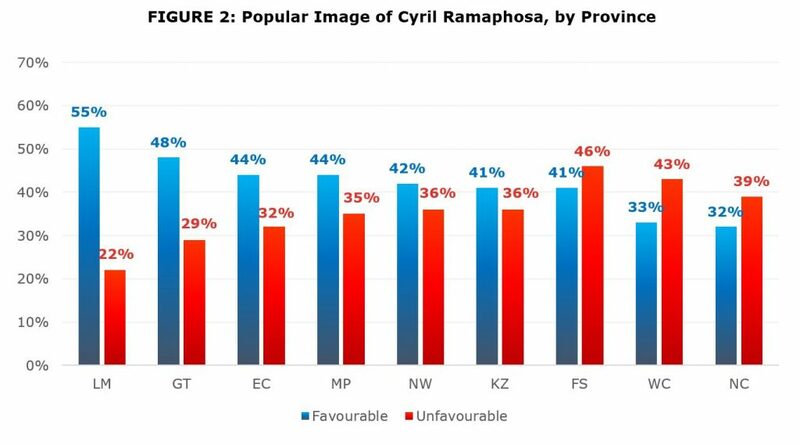 Geographically, favourable views of Ramaphosa are highest in Limpopo (55%) and lowest in Western Cape (33%) and Northern Cape (32%). 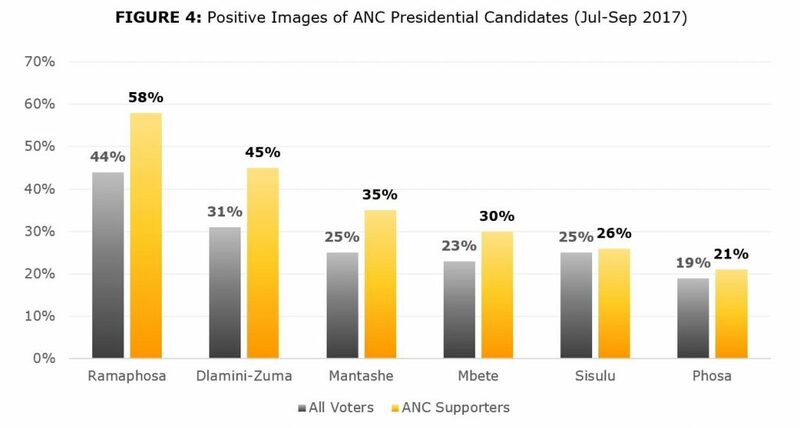 Dlamini-Zuma’s positive views range from 49% in KwaZulu-Natal to a low of 23% in Limpopo [FIGURE 2 AND FIGURE 3]. 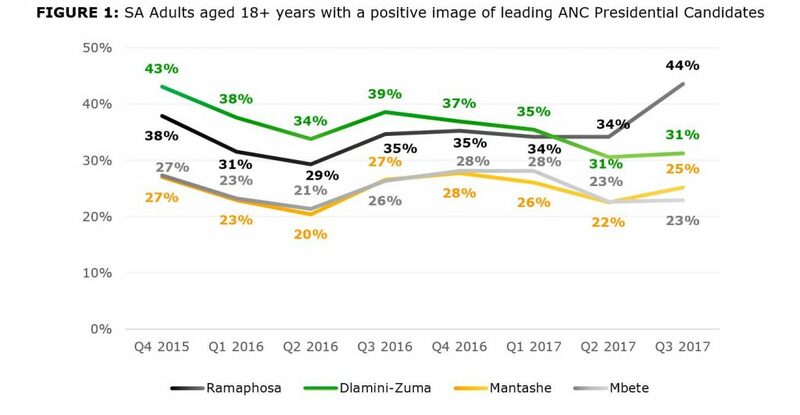 Note how Ramaphosa’s 13 point lead over Dlamini-Zuma remains the same [FIGURE 4]. 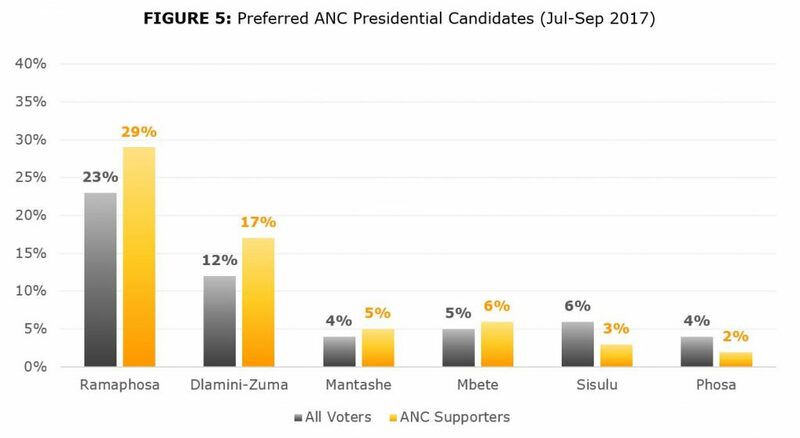 Because many South Africans have similar views of multiple candidates, further investigation separated out those ANC supporters that clearly preferred one candidate over the others. When framed in this manner, about one-quarter of ANC supporters prefer Ramaphosa (29%), while one-sixth prefer Dlamini-Zuma (17%). Support for the others is under 10%. Once again this illustrates the lead that Ramaphosa has over Dlamini-Zuma. It’s also important to note that just under 40% of ANC voters have no clear preference of any of their leaders. Thus, Ramaphosa’s lead amongst ANC supporters is narrower than his current lead in the party nomination process. 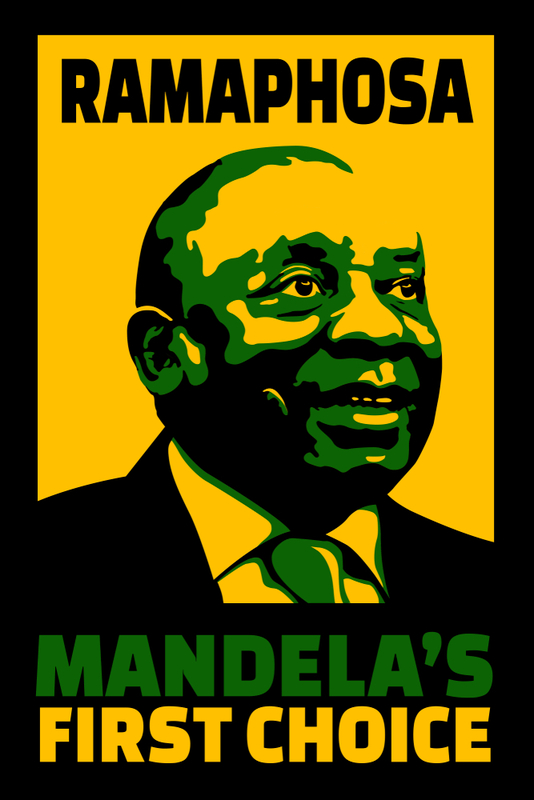 The Institute of Race Relations has recently surveyed the three-quarters of ANC branches who have nominated a candidate, and estimates that Ramaphosa has, thus far, secured around 65% of branch nomination while Dlamini-Zuma has 30%. This is not surprising. Political parties are not perfect representations of their voters, and the ANC is no exception. But this difference also reflects the fact that while South Africa uses proportional representation to elect its representatives, the ANC does not. Citizen Surveys has carried out the South African Citizen Survey (SACS) since July 2015. It is based on face-to-face interviews with a nationally representative sample of 1,300 respondents per month. Results are reported quarterly on a total of 3,900 respondents, which produces results with a margin of error margin of error of ±1.5 percentage points at the 95% confidence level. The sample is designed as a multistage national probability sample, stratified by all provinces and metro, urban and rural areas, with probability proportionate to population size, based on the latest StatsSA estimates of the population aged 18 and older. Interviews are conducted in English, Zulu, Xhosa, Afrikaans, Sotho, Sepedi, and Setswana. The sample is weighted to the most recent population estimates and represents the national adult population with respect to province, race, gender, age, and geographic area type.